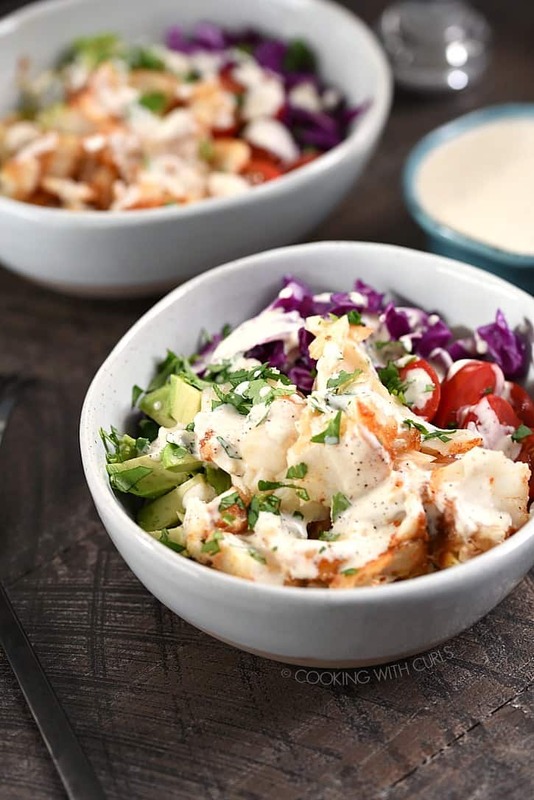 If you are looking for a healthy and delicious meal the whole family will love, look no further than these Fish Taco Bowls! 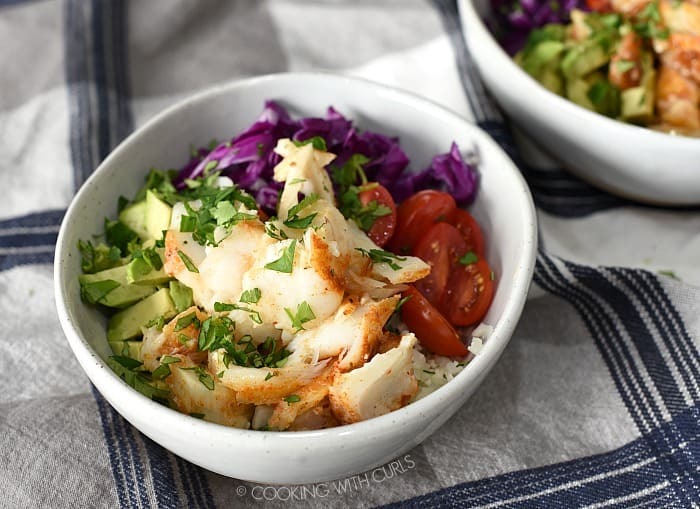 The seasoned cod is baked to perfection and placed on a bed of Cilantro Lime Cauliflower Rice alongside shredded cabbage, halved cherry tomatoes and diced red onion and avocado, then topped of with an amazing Garlic-Lime Sauce!! Preheat oven to 375 degrees. Line a baking sheet with foil or parchment paper, set aside. 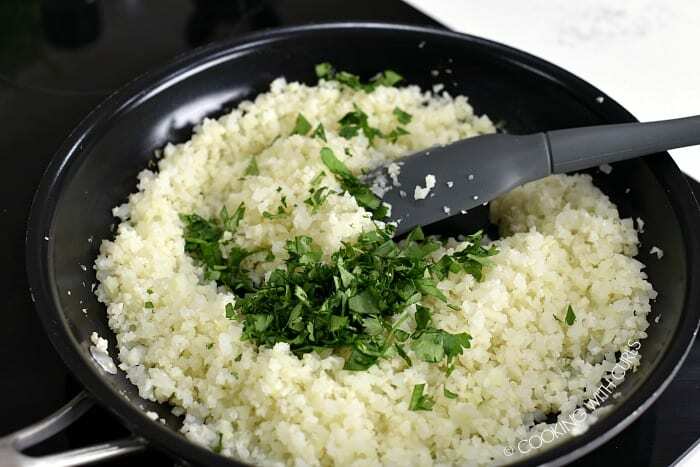 Whisk the garlic-lime sauce ingredients together in a small bowl. Cover and refrigerate until ready to use….. Mix the cumin, chili powder, salt and pepper together in a small bowl. 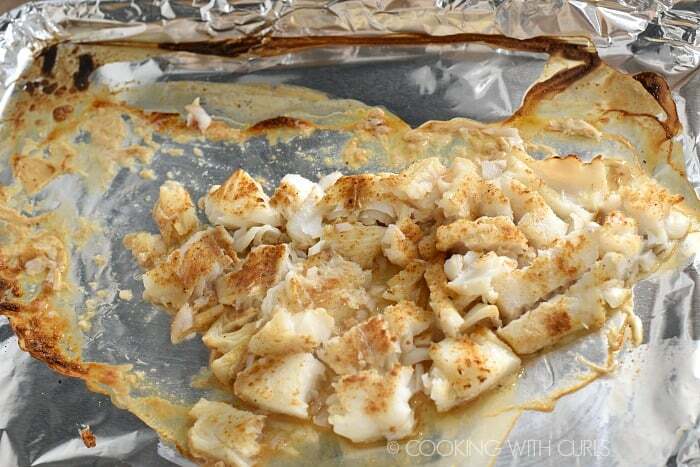 Sprinkle the mixture over both sides of the cod and place on the baking sheet…..
Drizzle with olive oil and place in the oven. Bake for 20 minutes, until fish flakes with a fork. 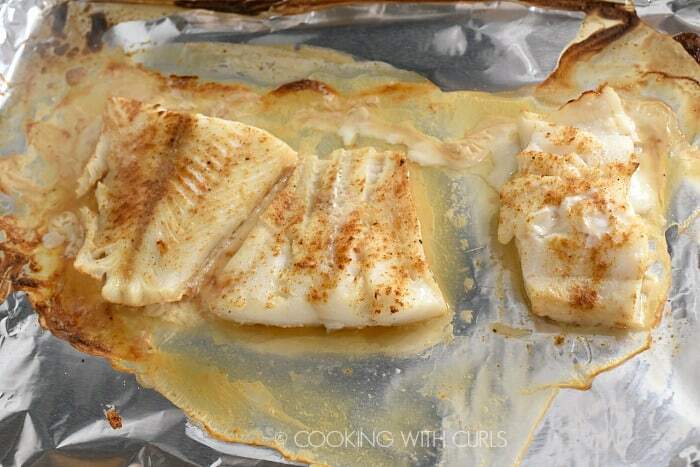 For a crispier fish, broil for 3 to 5 minutes until the edges are browned….. Remove from oven and set aside. Chop into bite-sized pieces before serving…..
Heat a large non-stick skillet over medium-low heat. 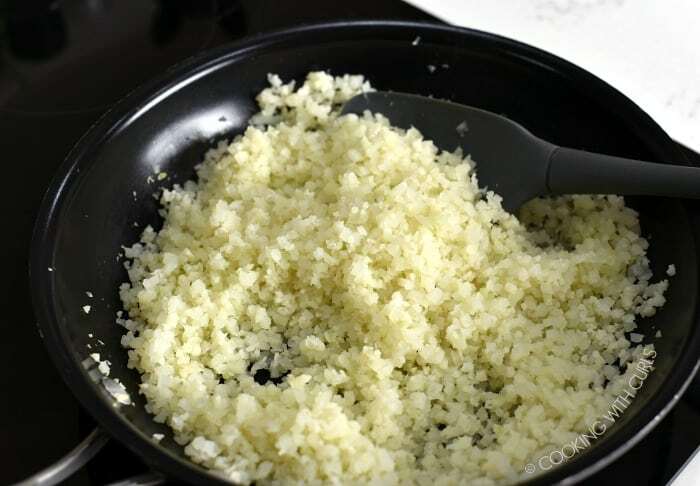 Add 1 teaspoon of oil, and add the riced cauliflower. 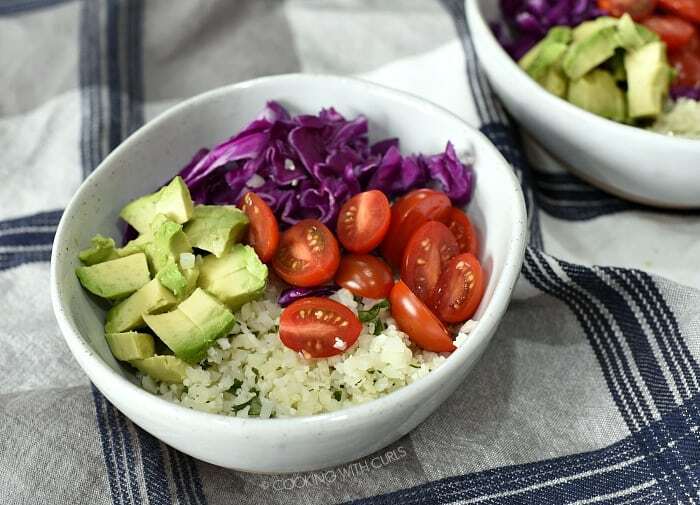 Cover skillet with a lid and cook for 4 to 5 minutes…..
Stir in the lime juice and chopped cilantro…..
Divide the cauliflower rice between 4 bowls. Add the shredded cabbage…..
Add the halved tomatoes and diced avocado and red onion….. I used my red onion for a different recipe yesterday, oops! 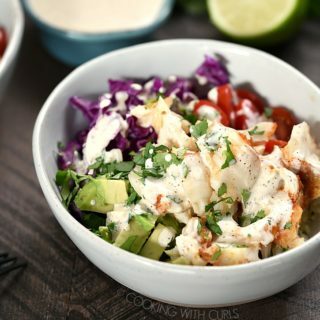 Divide the fish between the four bowls and sprinkle with the chopped cilantro…..
Drizzle the Garlic-Lime Sauce over the bowl and serve….. I used frozen, wild-caught cod. You could also substitute skinless halibut, any other white fish or even salmon. You can sprinkle the cod with Taco Seasoning if you like. For spicier tacos, add cayenne or Sriracha sauce. 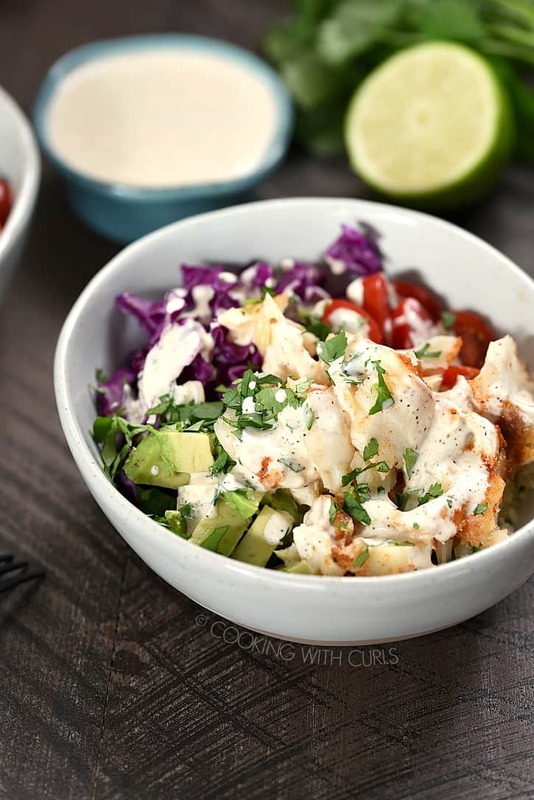 These Fish Taco Bowls are Whole30 & Paleo compliant. They may also be Keto friendly, but I don’t know enough about that one. Yes, you can substitute regular or brown rice in the same quantity. Cook as directed and stir in the lime juice and cilantro. I used red cabbage, but green cabbage would also work…or a combination of the two. Fish Tacos with Papaya-Mango Salsa – Papaya-Mango Salsa would be delicious on these Fish Taco Bowls as well! 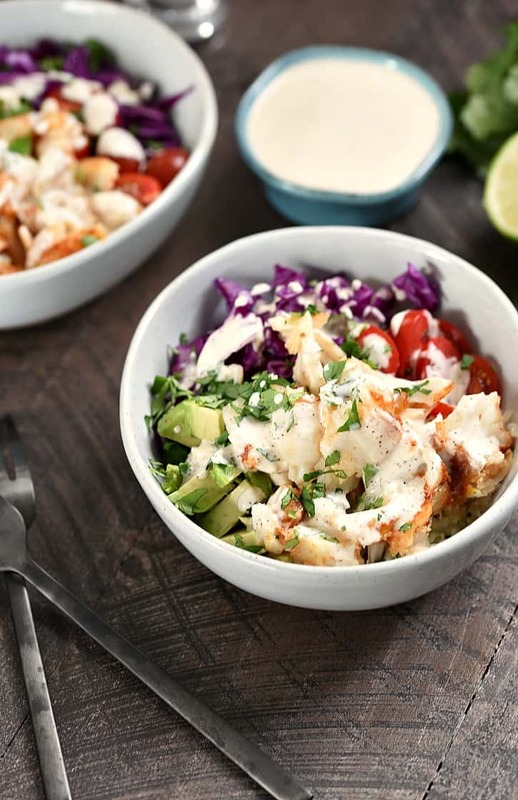 If you are looking for a healthy and delicious meal the whole family will love, look no further than these Fish Taco Bowls! Whisk the garlic-lime sauce ingredients together in a small bowl. Cover and refrigerate until ready to use. Mix the cumin, chili powder, salt and pepper together in a small bowl. 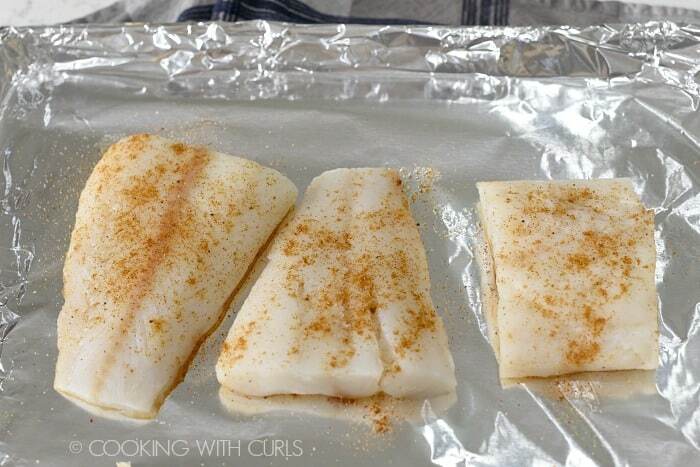 Sprinkle the mixture over both sides of the cod and place on the baking sheet. For a crispier fish, broil for 3 to 5 minutes until the edges are browned. Remove from oven and set aside. Chop into bite-sized pieces before serving. Cover skillet with a lid and cook for 4 to 5 minutes. Stir in the lime juice and chopped cilantro. 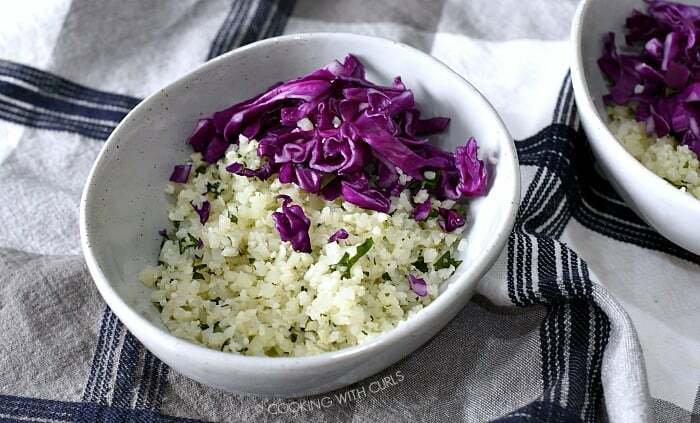 Divide the cauliflower rice between 4 bowls. Add the shredded cabbage. Add the halved tomatoes and diced avocado and red onion. Divide the fish between the four bowls and sprinkle with the chopped cilantro. 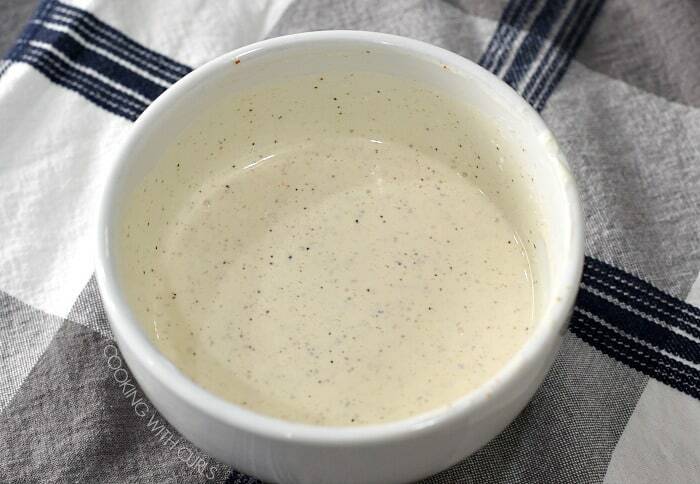 Drizzle the Garlic-Lime Sauce over the bowl and serve. I debated adding mixed greens to the bottom of the bowl, but I wasn’t sure if that would turn it into a salad bowl? LOL. Feel free to add 6 cups of mixed greens if you so desire.